Guests with disabilities have many options available to them when visiting either a Disney Resort or Disney Theme Park. Almost all of the Disney attractions, restaurants, shops, and shows are accessible to guests with disabilities. 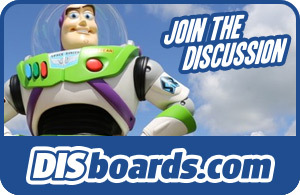 The DIS also maintains an excellent discussion forum for visitors with disabilities. Click below to ask questions and to share your experiences with others! When a guest is in need of specific accommodations due to a disability, the Disney Disabilities Services department can make all of the necessary arrangements. All locations at Walt Disney World (theme parks and resorts) have available parking for guests with disabilities. You must have a valid parking permit displayed in order to park in these areas. Disney's Hollywood Studios -- opposite Star Tours, Soundstage 3, Rock 'N' Roller Coaster, opposite The Twilight Zone Tower of Terror and at Fantasmic! Animal Kingdom -- Discovery Island opposite the Flame Tree Barbecue, Harambe Village in the Mombasa Marketplace, Conservation Station at Rafiki's Planet Watch, Asia near Maharajah Jungle Trek, and Chester and Hester's Dinosaur Treasures in Dinoland U.S.A.
Magic Kingdom -- Adjacent to the Crystal Palace off Main Street, U.S.A. These locations provide a place to store medications or receive assistance.